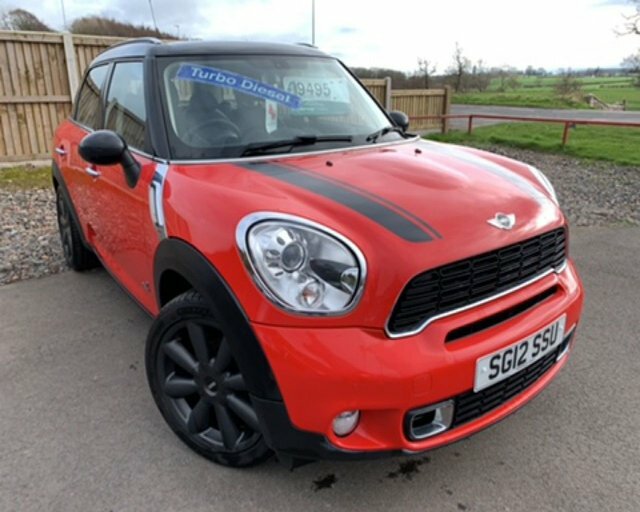 THIS RECENT ARRIVAL IN TO OUR STOCK IS A MINI COUNTRYMAN 2.0 D COOPER S ALL4 5-DOOR 141 BHP 6-SPEED MANUAL, FINISHED IN PURE RED WHICH IS COMPLIMENTED BY A FULL CARBON BLACK LEATHER UPHOLSTERY. THERE HAVE BEEN TWO REGISTERED KEEPERS FROM NEW & IT COMES COMPLETE WITH A FULL MINI MAIN DEALER SERVICE HISTORY, THERE ARE FIVE STAMPS IN THE BOOK UP TO 15/06/2018 @ 46995 MILES. STANDARD SPECIFICATION INCLUDES COLOUR SATELLITE NAVIGATION, BLUETOOTH CONNECTIVITY, 18 INCH 8-SPOKE BLACK ALLOY WHEELS, REAR PARKING SENSORS, DAB RADIO, CLIMATE CONTROL, CRUISE CONTROL, LEATHER 3-SPOKE MULTI-FUNCTION STEERING WHEEL, ELECTRIC FRONT WINDOWS, ELECTRIC FOLDING MIRRORS, BLACK ROOF, MIRROR CAPS & REAR SPOILER & IT HAS TWO SETS OF REMOTE KEY FOBS. 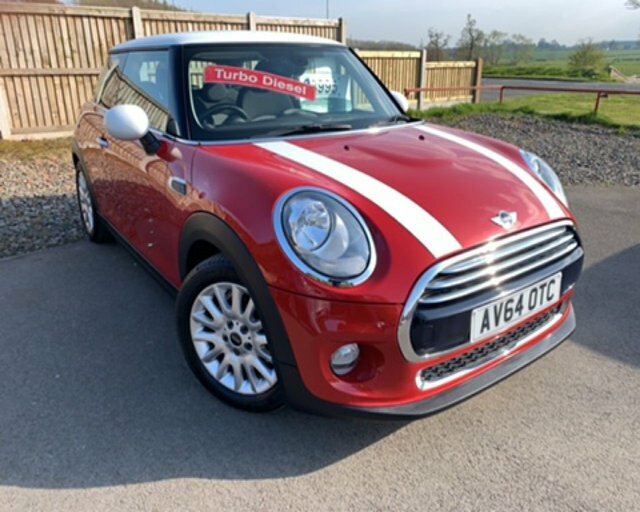 2014 64 MINI COOPER 1.5 DIESEL 3 DOOR 114 BHP FINISHED IN BLAZING RED WHICH IS COMPLEMENTED WITH A PEPPER WHITE ROOF, MIRROR CAPS, AND BONNET STRIPES. THIS CAR HAS ONLY HAD ONE OWNER FROM NEW AND IS IN OUTSTANDING CONDITION THROUGHOUT. THIS CAR IS FULL OF FEATURES SUCH AS FRONT FOG LIGHTS, MULTI SPOKE ALLOY WHEELS, REAR BOOT SPOILER, LEATHER TRIMMED BLACK UPHOLSTERY, CRUISE CONTROL, MOOD LIGHTING,STOP/START FUNCTION, BLUE TOOTH HANDS FREE CONNECTIVITY, DUAL CLIMATE CONTROL,LEATHER CLAD MULTI FUNCTION STEERING WHEEL, AND A SIX SPEED GEAR BOX. CALL TODAY ON 01228599900 TO ARRANGE A TEAT DRIVE AND VIEWING WE OFFER EXCELLENT P/X PRICES AND FINANCE PACKAGES TO SUIT EVERY BUDGET. 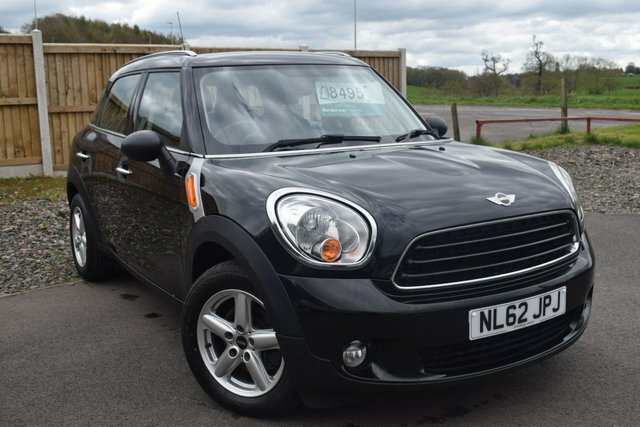 ANOTHER RECENT ARRIVAL INTO OUR STOCK IS A MINI COUNTRYMAN 1.6 ONE 5-DOOR 100 BHP FINISHED IN METALLIC BLACK WHICH IS COMPLIMENTED BY A BLACK CLOTH UPHOLSTERY. THERE HAVE BEEN THREE REGISTERED KEEPERS FROM NEW & IT COMES COMPLETE WITH A FULL SERVICE HISTORY UPTO 09/08/2017 @ 40698 MILES. THERE ARE THREE LONG LIFE STAMPS IN THE BOOK ( TWO BY MINI MAIN DEALER ). STANDARD SPECIFICATION INCLUDES BLUETOOTH CONNECTIVITY, AIR CONDITIONING, 16 INCH 5-SPOKE STAR ALLOY WHEELS, DAB RADIO, AUX PORT, USB PORT, ELECTRIC FRONT WINDOWS, ELECTRIC MIRRORS, REAR PARKING SENSORS, CUP HOLDERS, CHROME EFFECT ROOFRAILSCUP HOLDERS & IT HAS TWO SETS OF REMOTE KEY FOBS. Ready for a MINI adventure? Pay a visit to Intercars Of Carlisle Ltd today and take a closer look at the full range of used MINI cars for sale in Carlisle. Whether you're looking for a fun city runabout like the MINI 3-Door Hatch or a stylish cabriolet such as the MINI Convertible, our team is ready and waiting to help. We stock affordable used cars to suit every budget and you can buy with confidence as each one of our vehicles is thoroughly inspected before going on sale. Discover more or arrange to take a test drive in the used MINI of your choice by contacting a member of the team at Intercars Of Carlisle Ltd today.